"These muffins are delicious! The cinnamon sugar topping flavors them perfectly. This is my 10 year old brother's favorite recipe (he even makes them on his own from time to time)." In a medium mixing bowl, stir together flour, 1/2 cup sugar, baking powder, nutmeg and salt. Make a well in the center of the mixture. Stir together egg, milk and 1/3 cup melted butter. Add egg mixture to flour mixture; stir until just moistened (batter may be lumpy). Spoon batter into prepared muffin cups. Bake in preheated oven for 20 to 25 minutes. 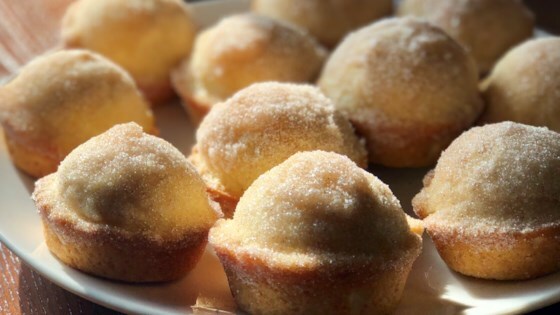 Meanwhile, combine 1/4 cup sugar, cinnamon When muffins are finished baking, dip tops of muffins in the melted butter, and then in the cinnamon sugar mixture. Serve warm. One of the simplest muffin recipes on here! Very tasty and done in no time. I wouldn't change a thing...except to make more next time. Definitely serve warm! Perfect with a cup of tea! Yum! I just made these. So simple and delicous. I made mini muffins and baked them for 12 minutes. My 4 year old dipped them in the butter and c/s mixture. This is a keeper for sure.